Discussion in 'Introduce Yourself' started by Cultivationz, Jan 19, 2019. Hello Forum. Can you please ID this orchid for me? It's growing in my garden in Bali Indonesia. Any help would be greatly appreciated. Kind Regards. 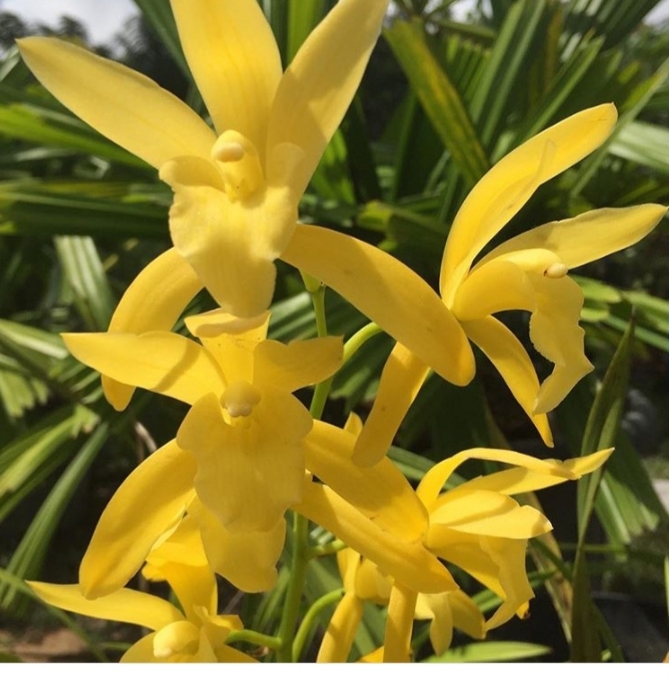 Cymbidium Golden Elf is a hybrid that does well in warm climates like Bali. This grex was made by Paul Gripp and registered by Rod McLellan Co. in 1978. The parents are Cym. ensifolium and Cym. Enid Haupt. One of the most widely cultivated cultivars is Cym. Golden Elf 'Sundust' which was mericloned and widely distributed. It is quite likely that your plant is this particular cultivar. Hi Gary...looks like the right call, but thinking ‘Sundust’? Thanks for the correction Chuck. I'll edit my post accordingly, so that our new member doesn't get confused. I hope that is OK. Actually...I was just thinking there was another clone (maybe one that I don’t kill trying to grow cold ). In any case, you can always blame your spellchecker! Cymbidium Golden Elf 'Sundust' was always sold as being "warmth tolerant", but in my experience warmth-loving is closer to the truth.